How Much Weight Can Your Vehicle Pull? Find Out In Our Tow Guides. Determining your vehicle’s tow rating is a crucial factor in determining what Fifth Wheel, Travel Trailer, Toy Hauler or Camper to purchase. If you plan on using your existing vehicle for towing or planning to purchase a new tow vehicle, it’s important to know what your limitations are before RV shopping. Knowing how much your vehicle can tow before RV shopping helps narrow down what you’re looking for as far as size and construction. Pulling too much weight puts stress on your tow vehicle’s engine and transmission. On the other hand, you want an RV with all the amenities you want and that’s large enough to fit all your travel companions comfortably. We want to make sure you are confident in your RV purchase from Wilkin’s RV. That is why we are happy to provide an accurate, up to date Tow Guide showing the weight rating of various trucks, SUV, and minivans available on the market from 1999-2016. This way, you are able to quickly and easily choose just the right RV to suit your vehicle. Looking for a light weight camper that your minivan can tow? Not sure if your half ton truck can pull a mid profile fifth wheel? Find Out the Answer Here! Each yearly guide is broken down into sections by make, model and engine type. If you know this basic vehicle information, you can then determine your tow rating. From there, compare prospective RVs’ dry weight ratings, also known as unloaded vehicle weight (UVW). 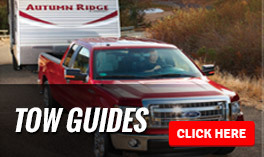 If you are in the market to buy a tow vehicle, our Tow Guides are also a handy reference. Whether you are looking for a new or used truck, SUV or minivan, you will find the tow rating you are looking for in our guide. Make sure your vehicle can tow the type of RV you’re interested in BEFORE you buy. Having more than enough power to get the job done will put your mind at ease while traveling on vacation. If you have any questions, feel free to Contact Us at Wilkins RV and one of our experienced RV team members will help answer any concerns you may have about your tow vehicle. We are always here to help!